Pill Organizer Box holds seven portable trays, one for every day of the week, each with four labeled compartments to coordinate pills and vitamins by the time of day. Never miss a dosage – every pill has its place for the entire week. Genius! This Compact Pill Organizer is perfect for anyone who is looking to be healthy and fit! Its tower design allows you to separate out the days. 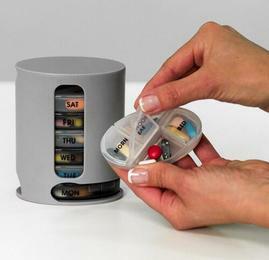 Each individual pod has 4 separate compartments which allow you to organize your pills by the morning, afternoon, evening and bedtime. Please don't hesitate to contact us if you need any assistance!